Ann Arbor (Informed Comment) – The Senate slapped the Trump administration around on Wednesday, voting 63-37 to bring to the floor a proposal to end US involvement in the Saudi-led war on Yemen. I should declare my own interest by saying that I was one of 50-some Middle East experts and policy-makers who signed a letter to the senators urging them to take this step. The letter, organized by Bruce Ackerman, Laurence Tribe and former US ambassadors to Yemen Barbara Bodine and Stephen Seche, pointed out that the UN estimates that some 14 million Yemenis could die of starvation within months if the Saudis continue their total-war tactic of attacking port infrastructure to deprive civilians of access to staples. The vote was the most significant bipartisan measure to come out of the senate in ages, and fell just short of a veto-proof two-thirds majority. The bill, co-sponsored by Bernie Sanders and a bipartisan set of his colleagues, calls on Trump to withdraw US troops from their support role in Yemen within 30 days. Since the war begin in 2015, the US (initially under Obama) has given the Saudis logistical support, including in-air refueling of bombers, as well as strategic advice on targeting. The senators voted to get out even though Secretary of Defense James Mattis and Secretary of State Mike Pompeo warned them not to vote for withdrawal. Pompeo threatened them with losing their next election if they were seen by their constituents to have allowed Iran a free hand in Yemen. The Saudis and the US right wing vastly exaggerate Iran’s role in Yemen; the rebellion is mainly led by indigenous Yemeni Zaydis, who belong to a branch of Shiite Islam that differs significantly from the Twelver branch practiced in Iran and Iraq. In any case, it is likely that most of the senators’ constituents would be rather more upset about US involvement in provoking the biggest humanitarian crisis since the end of WW II. The Saudi-led war has already killed 85,000 children with malnutrition and has killed tens of thousands of other civilians (which official statistics cover up). 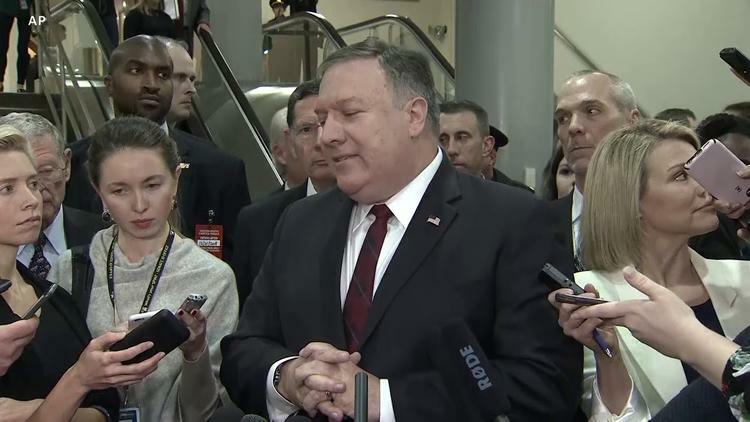 Pompeo also argued that this bill could make the Houthi rebels more intractable at upcoming peace talks. The vote likely reflected in part senators’ anger over the murder of dissident Saudi journalist Jamal Khashoggi, a columnist at the Washington Post, which everyone on the Hill reads. Many have been angered and frustrated by Trump’s collaboration in covering up the murder in the interest of maintaining business ties with Saudi Arabia (and given that some of those ties may have been to Trump’s personal business). Mattis and Pompeo probably lost Republican votes with their smug denials that the US was sure Mohammed Bin Salman ordered the hit. The senators were also angry that the White House appeared to prevent CIA director Gina Haspel from testifying to them. The Washington Post has reported that the CIA assesses that Khashoggi’s murder was ordered by crown prince Mohammed Bin Salman and that his brother Khalid, the Saudi ambassador in Washington, DC, was deeply involved in the assassination plot. I’ve been involved in a fair number of briefings on the Hill, and I can tell you that it is hard to get the senators to spend their time on foreign affairs. Both houses of Congress have for decades shirked their constitutional role in declaring war, as successive presidents ordered police actions and even full-scale wars at will. The step taken by the senate on Wednesday is not unprecedented. The victory in the House of Democrats in 2006 encouraged Bush to make preparations for getting out of Iraq. In 2013, the Republican majority in Congress signaled to President Barack Obama that they would not authorize the use of force in Syria, which pushed Obama to agree to Russia sequestering Syria’s chemical weapons instead. It is unclear how the Senate will vote on the bill itself (this vote was just to bring it to the floor for a vote), and even more unclear how the House will vote on this bill. And, of course, Trump may be apply to veto it without the senate sponsors having a two-thirds majority to overrule his veto. But at the least, the Senate won’t have contributed to a famine situation without so much as a protest.